On July 4 we march in the historic Takoma Park Independence Day Parade (2018 will be the 129th annual). On Labor Day we march in the Kensington Labor Day Parade. 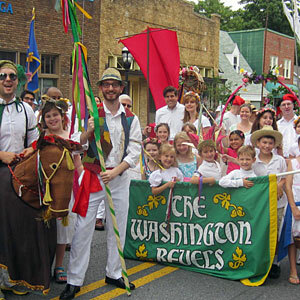 Check in with us in May/June (for Takoma Park Independence Day Parade) or July/August (for Kensington Labor Day Parade) to learn all the details about the next parade. Send an email to parade@revelsdc.org to learn how to join us to march, sing and celebrate.